The foldable 4 Step Safety Ladder, in blue, is perfect for any use around the home or garden. Tackle those out of reach jobs in your home and garden safely and easily. 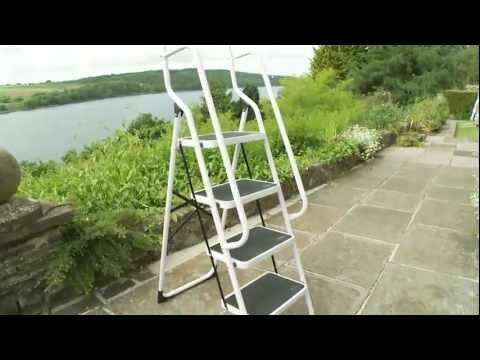 This four-step safety ladder features front and side safety rails and an extra high front safety rail reaching 61cm (2ft) above the top step for extra support. Oversized non-slip rubber trim steps reduce the chance of missed footing. Maximum standing height 96cm (3.1ft from the floor). Measures H158 x W48 x D85cm. The ladder folds down to H169 x W48 x D21cm, making it easy to carry and move around your home to where you need it most. Weight: 11kg. Maximum user weight 150kg. Some easy assembly required. This product comes with a two year manufacturer’s warranty, giving you complete peace of mind.